Over decades, her studio work has always embraced expressive painted, printed and dyed textiles that she creates herself. These have taken the form of wall pieces, art quilts and functional items which she has sold and exhibited locally, nationally and internationally. Her current bodies of work, the Tarp Series and the Drawing Series, add drawing and mixed media to those textiles. Bennett has lived in Iowa City since 1978 and is also known for her work in the local arts community, with her long affiliation with Iowa Artisans Gallery, Gallery Walk and local nonprofits. She is currently Board President of the Surface Design Association, a national nonprofit with 2300 international members working in art textile media. Her focus on art began with watercolor and teaching. Due to her degrees in Art Education she was always curious about exploring other mediums. This lead to paper-making, clay, painting on wood and fabric, and acrylic sculpture to express her ideas in a new way. There was never a surface that did not need color. Through out all her years of artistic exploration, watercolor is her first love. She will be demonstrating some of her techniques and showing examples of her work. Visit her website at www.theleftbankstudio.com. Moving through issues using art exploration to deal with difficulties, growth and fun with art. She is a retired teacher with many years in the classroom with young children. Presently, Karen is a volunteer Zentangle teacher at the Senior Center. Karen is a certified art teacher with an elementary teaching MA and a CTZ (certified Zentangle teacher). Marilyn Moore – As a long time basket maker Marilyn Moore has become focused on the possibilities of working with wire and wire cloth to make her art. She will be demonstrating some of her techniques, and will be showing you examples of her work with wire. Marilyn will allow participants to play with some of the techniques and materials that she utilizes in making her art whether, it be baskets or jewelry. Visit her website at www.marilynmooreswired.net. Robert Yale Richardson is retired from thirty-five years as the prepress manager for Tidewater Direct in West Branch, Iowa. His focus in retirement is on painting and drawing with watercolors, pastels and ink. 2004-05 he contributed a weekly editorial cartoon in the Iowa City Press Citizen under the name rytoonz. 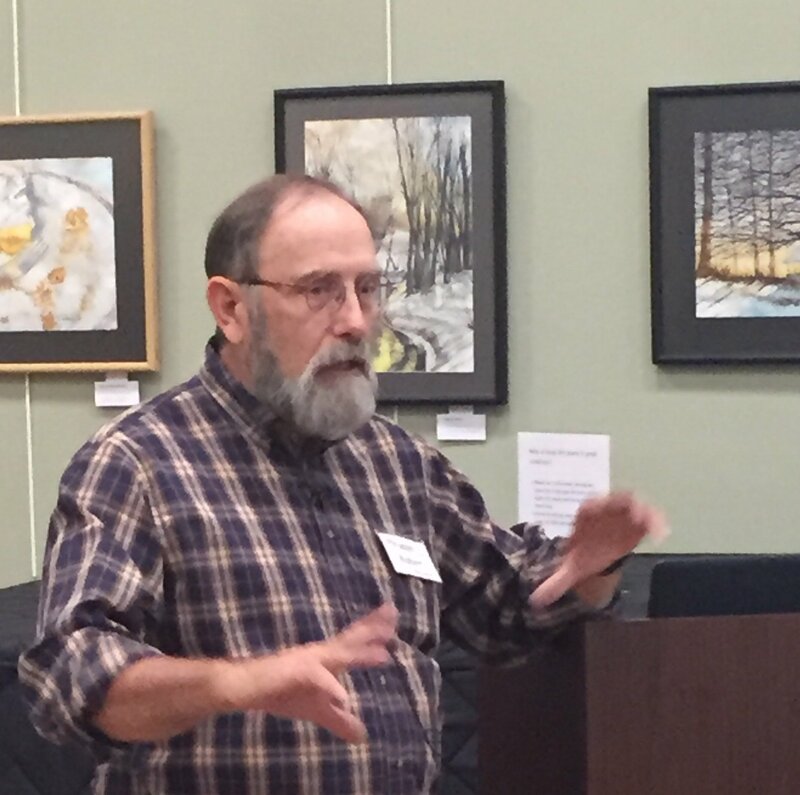 Robert teaches an evening class, “Cartooning for Beginners,” through the Coralville Parks and Recreation Department. His art will be on display in the Senior Center’s assembly room for the event. Visit his website at rytoonz.wordpress.com. Latif Behroz is a peace volunteer who has done “art and graffiti for peace”; a series of paintings on walls in Kabul, Afghanistan. Along with his activist friends, Latif has also set “The Kindness Wall of Kabul”: a painted wall where people can leave clothes and other items for those in need. (The wall is featured in The New York Times, March 24, 2016). Latif is currently a student at Scattergood Friends School in West Branch and wants to continue the Kindness Wall project here in Iowa City.